You can't really miss St Andrew's Parish Church, Moffat. 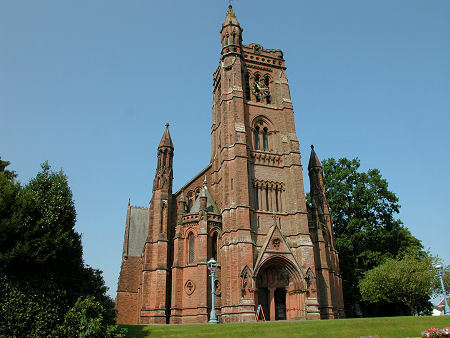 Its huge red stone tower dominates the approach to the town along the A701 from the M74 and the south. And even if it had been built in a more retiring position it would be difficult to overlook the largest parish church in South West Scotland. 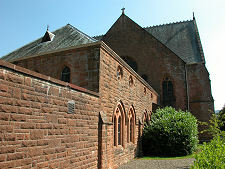 The first recorded Parish Church, in what was known as the Auldton of Moffat, was already built by 1177, when it is recorded as being transferred to the Bishop of Glasgow. In the 1600s it was used as a prison for Covenanters en route to their execution (see our Historical Timeline). 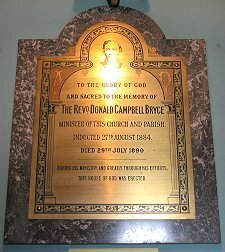 In 1790 the prime site opposite the Black Bull Hotel was given by the Earl of Hopetoun for the building of a new church. This was duly built, with seats for 1,000 people. The church was topped off with a spire, which carried the Earl of Hopetoun's crest of a flying spur. 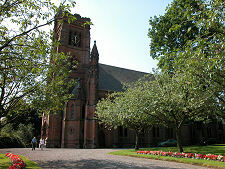 As a result the church became known to townsfolk as the Flying Spur Kirk. The Flying Spur Kirk did not last for long, being replaced by a new parish church on a site immediately to its south. 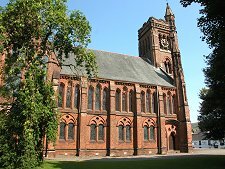 St Andrew's Parish Church, Moffat, opened its doors for worship for the first time on 23 September 1887, just 97 years after the Kirk it replaced. 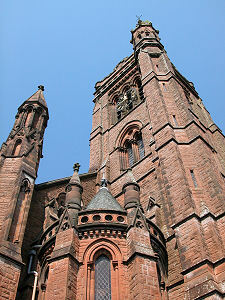 It was designed by John Starforth, an Edinburgh-based architect, and built of red sandstone from a local quarry. St Andrew's was built in an age and in a town where quality was paramount, and the result is a no expense spared approach to construction that has lasted well. 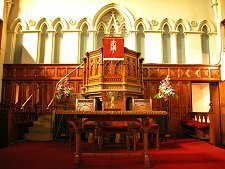 The total cost of the church and manse, including seating for 1,150 worshippers and clearing the older church, was £14,000, a very large sum for its time. The clock in the tower was added in 1932. 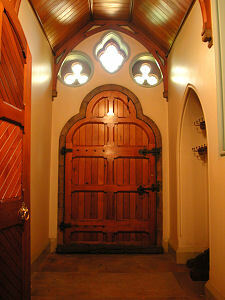 To the west of the church itself is a simpler church hall, extended in 1898. Externally, the glory of St Andrews lies chiefly in its east end, towering - literally - above Church Gate. Octagonal buttresses and a stair tower add to the vertical presence of the main tower. The rest of the church is much less obvious, with views from other directions being largely screened by trees. But the detail is remarkable from every angle, featuring with no fewer than eighty carved heads of angels and gargoyles. Inside the church you are faced with a huge yet friendly space. The braced wooden roof supports span the 15m width of the church. The transepts towards the west end are shallow and subtle. The most striking internal fixture is the gallery. This sweeps round the north and south sides and east end of the church, supported on iron brackets on the walls and fine cast iron columns that help preserve the open feeling of the internal space. 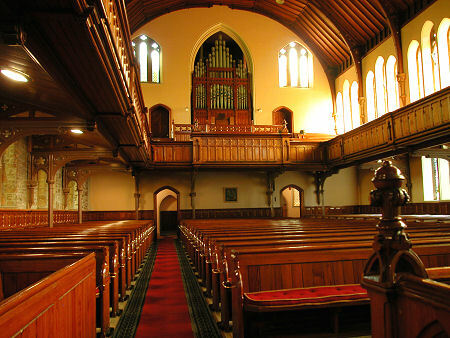 At the east end of the church the gallery is home to the large organ dating back to 1894. The main focus of the interior of St Andrew's lies at the west end with the beautiful pulpit, above which is a large rose window flanked by two smaller windows. 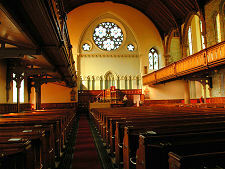 These are among the large number of windows that add so much to the atmosphere of St Andrew's. There are two rows of windows along each side of the church, one above the gallery level, one below it. Many of these contain beautiful stained glass, including one window transferred from the earlier Flying Spur Kirk.